Like Shmologna, I loved watching Dr. Quinn. It's so fascinating to hear stories of the struggles women, like Taylor, had to go through to be accepted into certain professions. I think you'd enjoy any of Cathy's books. 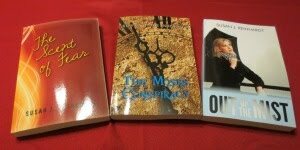 While each book is a stand alone, you might want to read, "Forevermore," first, then "Whirlwind," and finally "That Certain Spark." They all take place in the same town. You find books with the greatest covers! Love this one! Thanks, but I can't take credit for "finding" these books with the great covers. A dear friend sent me all four of the Cathy Marie Hake books I've shared here. My Mom also loved her books. I hope other folks will pick them up and see what they're missing. This sounds great--and so unique. Thanks for the review! Sounds like a great book! Thanks for the review, Susan! Since reading these books, I wouldn't hesitate a second to pick up another one of her titles. You're welcome! I hope you'll add her books to your Wish List. Susan, I'm ashamed to admit I write for the CBA and haven't yet read a Hake book. Your post makes me want to dive in. I've always loved the cover art for her books! They look like a great escape. The book covers capture the characters' personalities.